Pioneers in the industry, we offer delta asda-a2-u servo motor and panasonic mhmf082l1u2 servo motor from India. 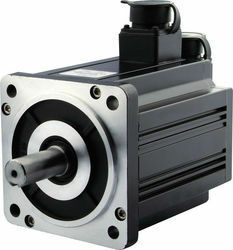 Our vast industry understanding enable us offer a wide range of Delta ASDA-A2-U Servo Motor. To meet the demanding requirements of motion control applications in industrial automation and satisfy the needs of high-precision positioning control requested by machine designers and system integrators, Delta launched the high-performance motion control ASDA-A2 series servo motors. High Precision Control: ECMA series servo motors feature incremental encoder with 20-bit resolution (1280000 pulses/revolution). Existing functions to meet the requirements from delicate process have been enhanced. Stable rotation at low speed has also been achieved. Up to 1kHz frequency response. Settling time below 1ms. Superlative Vibration Suppression: Built-in automatic low-frequency vibration suppression (for crane control): two vibration suppression filters are provided to minimize the vibration at machine edges automatically and sufficiently. Flexible Internal Position Mode (Pr Mode): SDA-A2-Soft configuration software provides internal parameter editing function for defining the path of each axis freely. 64 internal position settings are offered for continuous motion control. Destination position, speed and acceleration & deceleration commands could be changed in the middle of operation. 35 kinds of homing modes are available. Unique Built-in Electronic Cam (E-CAM): Up to 720 E-CAM points. Smooth interpolation between points can be completed automatically to yield a flexible programming. ASDA-A2-Soft configuration software provides electronic cam (E-CAM) profile editing function. Applicable for rotary cutoff and flying shear applications. Full Closed-loop Control (Capable of reading second feedback signals): Built-in position feedback interface (CN5) is able to read second feedback signals from motor encoder and send the current position back to the drive to form a full closed-loop so that high accuracy position control can be accomplished. Reduce the effects of mechanical imperfections such as backlash and flexibility to ensure the position precision at machine edges. 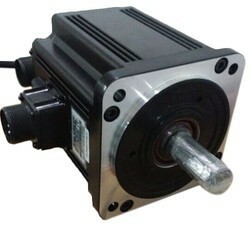 We are offering Panasonic MHMF082L1U2 Servo Motor.